I have a stock '97 Max which I love dearly! Fortunately for me, the weather here is such that one can ride all year round. I'm not someone who likes to use the horn on my bike at any time other than in an emergency. When I do use it though, I want it to work and to work LOUDLY! I got tired of the mosquito frightener fitted as standard equipment. Shortly after getting my Max, I fitted a pair of Fiamm horns, which has made a huge difference. Now when I hit the horn button people actually hear the horn! 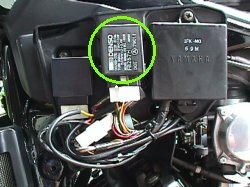 I ran a single wire in a PVC sleeve from the battery, along the same path as the existing wiring harness, to where I fitted a relay behind the left side "air scoop". I fitted an in-line 20A fuse at the battery end of this new wire. Be sure to use a heavy enough wire for this job. Around 13 AWG (2,5mm2) will do it. The ground connection for the new horns was taken from an existing bolt in the chassis an inch or so from the new relay, behind the plastic mounting plate that all the relays and stuff are mounted on. 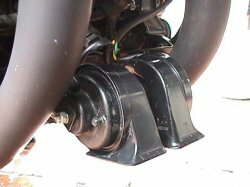 A pair of Fiamm horns mounted between the front exhaust headers. They are relatively out of the way and not too conspicuous while still being sufficiently out in the open to allow good volume, which is what I wanted to achieve. The horns do not like water in them! They don't seem to suffer any permanent damage but they definitely cease to function until they dry out fully. Because of this they're mounted with the opening facing downward to try and avoid water getting into them. 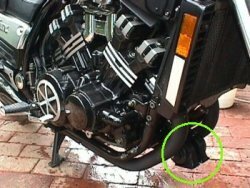 There's a good spray in this location from the front wheel when riding in the wet so aim the horns accordingly. Each horn is mounted to its "tag" with a single nut and lock washer. They're very easy to remove if you need to do this for any reason. 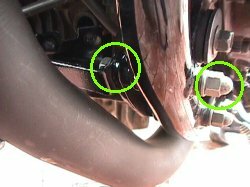 When you make up the mounting bracket (next pic) make sure the "tags" are long enough for the horns and mounting nuts to clear the exhaust headers. This is a simple affair made from a strip of mild steel about 3/32" thick and about 1" wide. The outer ends of the main horizontal piece are secured by existing chassis bolts (next pic) and two "tags" (made of the same size steel) were welded onto the main horizontal to carry the horns. The horns require that this tag be able to resonate with the horns in order to work correctly so the steel used for the tags shouldn't be too thick or too rigid. Left hand side bracket mounting point using existing bolts. The right hand side is pretty much a mirror image. 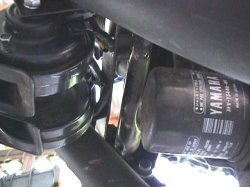 There should be enough space between the horns and the oil filter to allow easy oil filter removal. The mounting bracket is higher than the oil filter so it shouldn't get in the way during filter removal. If the horns get in the way of removing the filter they can easily be removed seeing as they are each secured with just a single nut and lock washer. The new horn relay gets installed behind the left "air scoop". 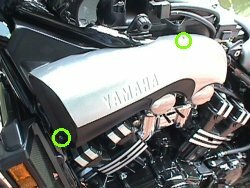 After removing the "tank" cover, remove the left "air scoop" (two hex mounting screws circled). Behind the left air scoop there's a bunch of electrical stuff. 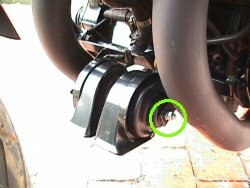 Lift off the flasher relay (circled) to reveal the perfect spot for the new horn relay (next pic). 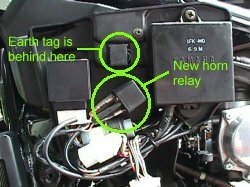 The horn relay is already installed in this pic, behind the flasher relay. The new horn relay is mounted using an existing screw found in this spot. It all fits very neatly. Once the new relay is fitted and wired, the flasher relay simply clips back into place again and it looks like the previous pic. 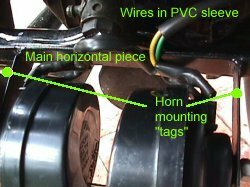 I got the ground connection for the new horns from an existing bolt directly behind the flasher relay mounting tag although almost any point on the chassis will do. The pink and brown wires are the original horn wiring, disconnected from the original horn and re-routed (pulled back) up into the area where the new relay is fitted. The lugs on these two wires should fit straight onto the new relay. Nice and easy. The yellow wire is the positive feed from the battery. 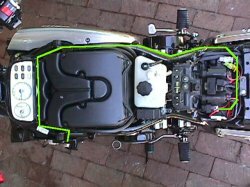 This pic shows the area on top of the battery, under the seat. 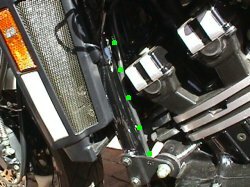 The new connection is made in the area of the battery positive terminal on the left side of the bike. 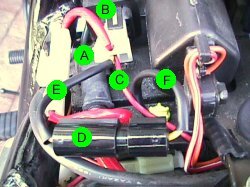 The battery positive terminal (A) feeds into the main fuse (B). The main fuse feeds out on a red wire (C) to the ignition switch. 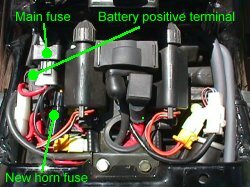 The new horn fuse (D) should be fed (E) from the same point on the main fuse as the ignition switch (C) rather than the side that's connected to the battery. This way you get the benefit of the main fuse's protection. From the horn fuse, a wire (F) feeds the horn relay. Here's the route I followed from the battery to the new horn relay. 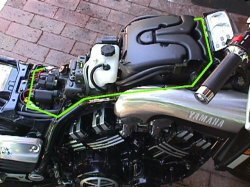 This route follows the frame tubing as well as being the same route that the existing wiring harness follows. 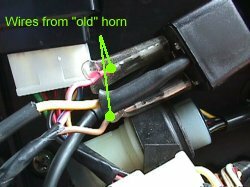 The new horn wiring, from the relay to the horns, is run in a PVC sleeve and runs the same route as the old wiring did.